Here are seven important reasons why organizations need to put an end to the torture test known as performance reviews. For decades, employment lawyers have been advising HR professionals to make sure managers record employee’s poor performance “in case we need evidence to support their termination in the future.” That may be sound legal advice, but it’s a sure-fire way to destroy trust. How motivated would you be to put your heart and soul into that relationship? How likely would you be to make personal sacrifices for the person who is preparing to destroy you in case things go sideways? The very act of keeping a record of the things that someone else does wrong creates an adversarial relationship, provoking suspicion, distrust, and disengagement. People who believe that their talents can be developed have what researcher Carol Dweck calls a “growth mindset”. They tend to be higher achievers than those with a fixed mindset (who believe their talents are innate) because they worry less about looking smart and they put more energy into learning. Since feedback is critical to high performance, it should come as no surprise that people with a growth mindset are more likely to seek and accept critical feedback… except when it comes in the form of a performance review. A 2013 study revealed that people with a growth mindset, presumably your best employees, find negative feedback delivered in performance reviews just as offensive as those with a fixed mindset. Although the researchers didn’t have an explanation for this finding, the answer is fairly obvious. A Gallup study revealed that three out of four people suspect their performance evaluations are unfair and inaccurate; and their hunch is right. 90% of HR professionals, the ones who should know if performance reviews work, believe they are inaccurate. Whether you’re a star employee or not, everybody hates being evaluated by a flawed system that produces inaccurate and unfair results. Result? People aren’t listening to any critical feedback. Instead, people on the receiving end of a performance review transform into courtroom lawyers, scrutinizing the weaknesses in the prosecution’s argument so they can present their counterargument. When performance reviews are tied to compensation, not only does it discourage people from accepting feedback, it encourages them to dodge accountability. 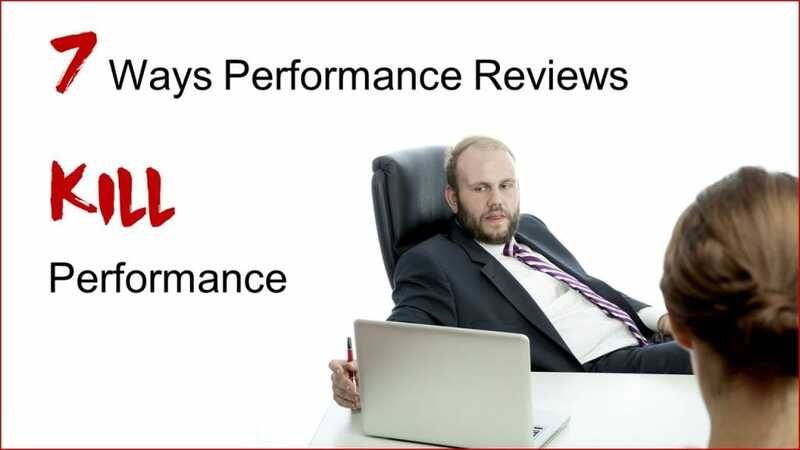 Performance reviews are designed to be a one-way feedback mechanism. Scheduling a time to provide one-way feedback effectively communicates to employees “My opinion is the only one that counts because I’m more important than you.” It’s as if the performance review was intentionally designed to subliminally convince employees that they are in a master-servant relationship. To be required to sit through a one-way feedback session is a form of emotional and psychological abuse that subtly erodes the confidence of the person on the receiving end. Since confidence is essential to high performance, it should come as no surprise that a meta-analysis of 607 studies published by The Psychological Bulletin revealed that employees’ performance actually decreased 30% of the time after performance reviews. David Rock, director of the Neuro Leadership Institute and author of Your Brain at Work, discovered that performance reviews encourage a fixed mindset, which inhibits learning. Feedback is only useful if it is specific to one issue and provided within a short period of time. People need time to digest feedback and determine what to do with it. Multiple pieces of feedback coming at people at once tends to be overwhelming and difficult to process, accept, and act on, rendering the feedback useless. Waiting until the end of the year to let employees know where they stand sets people up for failure. Managers who save up their most meaningful feedback until the end of the year allow employees to continue floundering when they could have otherwise been succeeding. Of course, most managers provide snippets of feedback throughout the year, but its only during the annual performance review that managers feel obliged to be totally transparent about employee’s performance so they can use it to justify a lower pay increase than the employee would like. Instead of providing feedback one issue at a time and in a timely fashion, annual performance reviews encourage managers to bundle feedback and share it when it’s too overwhelming to absorb and too late to do anything about. That’s the opposite of useful. A 2017 survey by Deloitte revealed that 82% of companies believe that performance reviews were not worth the time. Deloitte knows this better than most. After adding up how much time their firm was spending completing the forms, holding the meetings, and creating the ratings, Deloitte discovered that it was spending 1.8 million hours a year on performance management tasks. But that wasn’t their most important discovery. After tabulating and categorizing the time performance reviews take, they realized that most of their time on performance management was spent talking about people, not talking to people. Imagine if, instead of filling out forms and talking about employees, managers in your organization spent that time talking to employees, providing them with timely coaching and feedback to accelerate their progress. It makes you wonder how many other organizational problems would disappear as a result. This article is an appetizer for what’s coming. I recently wrote a comprehensive guide for my clients about how to ditch performance reviews and replace it with something better. Its called The Definitive Guide To Enlightened Performance Management. It’s based on a truckload of research from various experts and from other organizations that have already ditched their performance reviews. In addition to sharing this guide with my clients, I’ve also decided to make it available to everyone in the Avail Leadership community, and to other organizations that would like some help transitioning to a more enlightened approach to performance management. The five elements of performance development. A new method of providing performance feedback, which includes high impact coaching questions for managers. How to keep managers accountable for providing effective performance feedback to employees. What to base compensation decisions on instead of performance ratings. The four steps of dealing with poor performance. How to deal with career development discussions. I will first release this guide in the next few weeks to everyone in the Avail Leadership community (everyone who receives my monthly articles) before I release it to the general public. I’d love to hear what you think of it. If you don’t already receive my monthly leadership articles, you can sign up HERE. I help organizations develop leaders at all levels through succession planning and management training. I’m the author of Succession Planning That Works, the ultimate succession planning guidebook & toolkit, and I speak about how to develop leaders and engage employees for higher performance. Great advice Michael! Thanks for sharing these valuable insights. As a person who spent 15 years as the HR director for Canada for an international company I agree 100% with all of you points but I would also add two more. When annual reviews are done employers know that the most critical part of their review will be based on their most recent performance. Very few companies would want to bring up issues which happened many months prior to the actual review. Also along with the trust aspect that you referred to, a performance review sets up a classic “us” and “them” relationship between management and employees much like the union shop mentality. Thanks very much Michael, I worked for a company where we did exactly that but I have long left it and from your narrative I wish I could go back and advise them to re look into their permanence system. 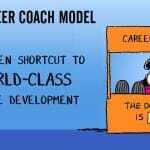 But problem is not quite with the company but HR consultants who are sourced as expert and their give such advice. So we need to get the right HR people on the ground, companies are consumers of products from expects. 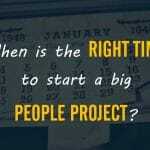 When is the Right Time to Start a Big People Project? 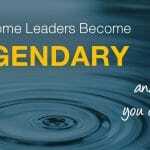 Why Some Leaders Become Legendary, And How You Can Too! Subscribe to receive periodic management and leadership development tips.